The Samsung Galaxy Tab Pro comes with either a 12.2”, 10.1” or 8.4” display, and all three displays have the identical 2560 x 1600 resolution. Depending on the country of origin, all three will be powered either by the 1.9 GHz Exynos 5420 or the 2.3 GHz Qualcomm Snapdragon 800 chip set. The 8.4" model comes with 2 GB of RAM and an additional internal storage of 16 or 32 GB. The 10.1" model also has 2 GB of RAM, while the 12.2" model has 3 GB of RAM and both of the larger models can be outfitted with either 32 or 64 GB of internal storage. All versions of the Tab Pro have a 2 MP front facing camera and an 8 MP rear facing camera. 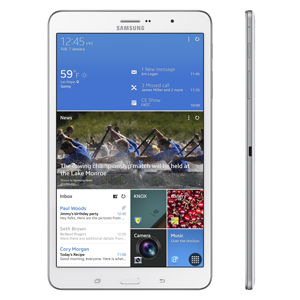 At launch, in February 2014, the Galaxy Tab Pro will be running a skinned version of Android 4.4, which makes the Galaxy Tab Pro the first device to be shipped with Magazine UX, Samsung’s replacement for TouchWiz.